Making the world a little happier and craftier. Carolyn ponders many topics in the course of a day. The following writing pieces are dedicated to Carolyn sharing her thoughts (and wisdom learned with her life lessons) with anyone that would like to hear them. A natural born teacher (she also holds a Master's degree in Art Education), Carolyn hopes to educate the world on many topics that can help humans live their best life. Use the search box to find specific "Art and Blog By Carolyn" blog posts! Loving this content? Donate to CBC! Click the button below to learn more! Yep. Minnie Pearl the American Eskimo (Spitz) is back in action……and peeing in the house again. She’s now about nine months old and potty training her has been one of the SLOWEST experiences I’ve ever witnessed. My former male dogs took to “normal” methods of potty training quite quickly, but our little girl has done everything at her own slow pace. She’s super smart, but we realized her smartness has been the reason everything has been so slow. She tells ME when she’s ready to do things and I’ve had to adjust my needs for this very reason. And I’m okay with that. We all want our pets to behave well and do what we want them to do, when we want them to do them, however, we aren’t in full control over them like we think we are. The key to training a dog is patience. Sure, we get frustrated with them and all their quirks, but we love them so we often have to let go of the frustration and go with the flow. This week I witnessed a girl getting angry at her dog (it was a hound dog sort-of a breed) for wanting to chase a squirrel when she was walking him. She called him a “dummy” quite loudly and then yanked him by her side and tugged him along. Even if she had trained him not to do this, he may have slipped up because, well, he’s a dog following his instincts. Speaking of training not to do something……back to Minnie Pearl pottying in the house again. We’ve been working hard at potty training and have successfully gotten her to go outside almost every single time she needs to go. To help myself through this slow process, I’ve been slowing reading through the book Training the Best Dog Ever . One of the suggested methods authors (Dawn Sylvia-Stasiewicz and Larry Kay…Dawn trained Bo Obama and other big name client’s puppies) reveal is keeping a potty log. Sounds ridiculous but it works! We were able to track Minnie Pearl averaging going potty (either #1 or #2) approximately 12 times a day. That’s when we realized she is still very young and still in need of frequent potty breaks. We also were able to start figuring out exactly when she needed to go, time wise. We often forget to celebrate the little successes in life. Instead of feeling frustrated that Minnie Pearl is still going in the house sometimes, I can now visually see her success ( example: she went outside 9 times and only went in the house 3 times!). The potty log helps you see the glass as half full instead of half empty. She had at least one perfect day this week! Yay! But then it turned cold the next day and she went on the floor in our kitchen even though we had taken her outside two times right before she did it. It seems cold weather tends to affect her behaviors. We noticed her being a little wild on her walks when the temperature drops too. I didn’t get sad about this event because I know she’ll get back on track. I also know someone else that has a small dog that had a similar behavior. My mom has a long haired chihuahua named Flower who only would potty on a potty pad when she lived in a cooler environment. When my mom moved to Florida, Flower decided she’d go potty outside. Flower was around 9 years old so that proved to me two things: #1 Flower probably preferred the warm weather (I mean, I don’t think I’d like to potty outside when it was really cold either!) and #2 Old dogs DO learn new tricks! Happy Friday ya’ll! Sending our light and love to anyone who needs it! 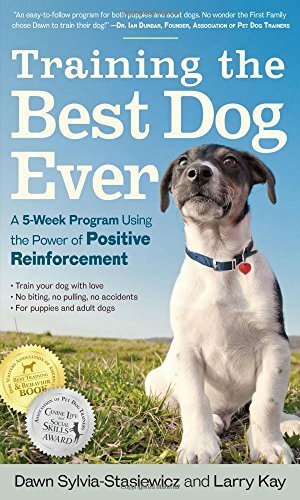 Consider buying and reading the book I’m using if you are trying to train your puppy too! You can use my direct link to Amazon below! If you follow through with a purchase, I’ll receive a small percentage of the sale proceeds. Every little bit helps Carolyn keep churning out free content for you! 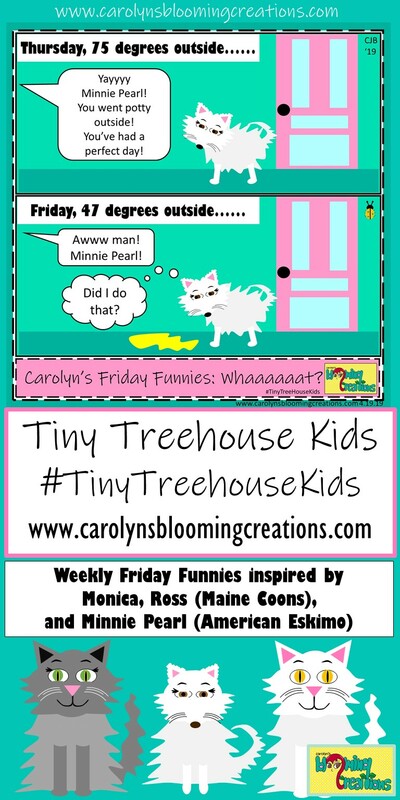 Don’t forget my kids page- Tiny Treehouse Kids! 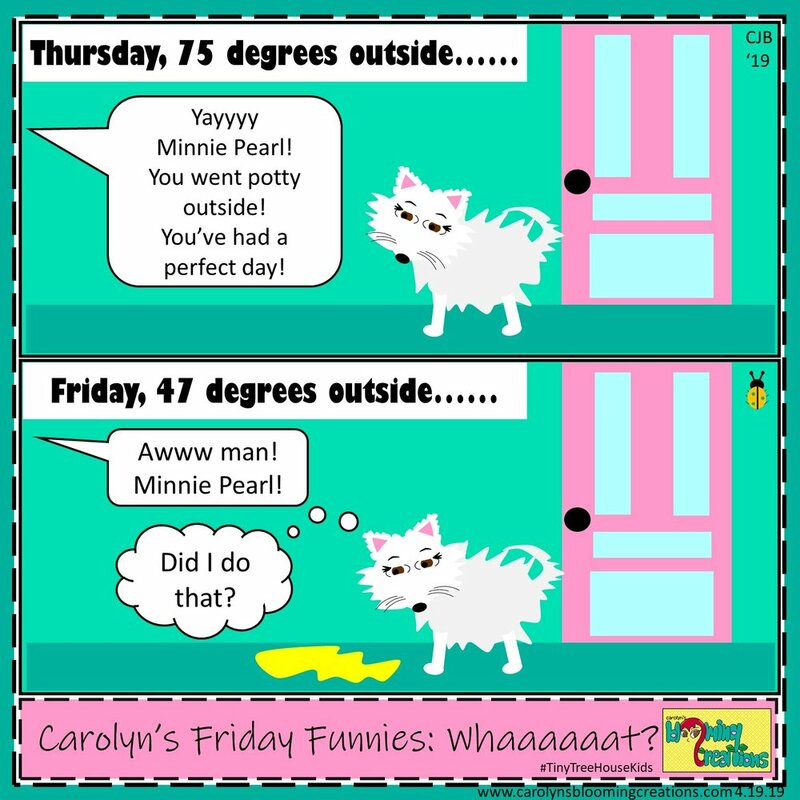 I post my weekly Friday Funnies comic there too and it’s a kid and parent approved page! Carolyn (BFA and MAEd) is a creative whirlwind who wishes to make the world a little happier and craftier. She wishes to spread her love of creativity throughout the world through her numerous projects. Currently she is writing, creating art and recipes and more. Visit her portfolio to see more of her creative talents. Visit the About page to learn more about Carolyn. Visit the Contact Us page with any questions, media inquiries, creative assistance, Reiki services, feedback, or just to say hello! Tommy (BAComm) is what you get when you combine Bob Vila with Bill Gates! He knows how to build a house as well as build a computer! Visit the Contact Us page regarding media inquiries, renovation or technology questions, feedback, or just to say hello! Select from the drop-down menus below to explore more articles within Carolyn's blogs. To help Carolyn and Tommy keep the free content they create on this site flowing, consider making your next Amazon purchase via their site. 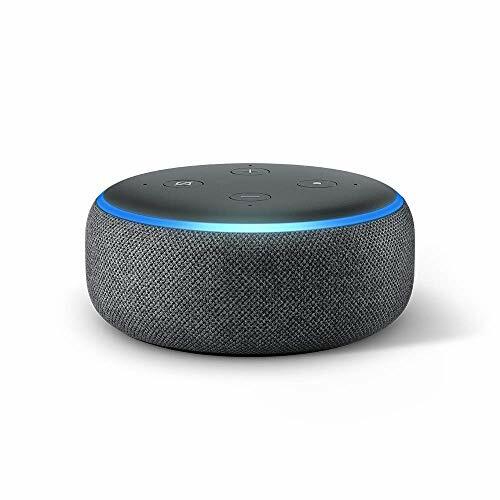 They will receive a portion of the purchase proceeds if you click (and follow through with a purchase) on any Amazon ad or product on their site. The choose the products specifically because they use them, and think you’d like them too! FYI: You will pay the same price buying them from the links on their site as you would buying them straight from Amazon. All your purchasing information will be privately acquired via Amazon ONLY. All content on this site is created and owned by Carolyn and Tommy Braden. By accessing www.carolynsbloomingcreations.com, you are agreeing to viewing and/or downloading materials for your own personal use only. Copying, broadcasting, downloading, transmitting, or altering is not permitted without written consent from Carolyn J. Braden. Contact Tommy or Carolyn Braden by clicking here. Subscribe to CBC and receive the FREE eBook by Carolyn, "The Path to Becoming Meat Free", an interactive, printable and downloadable guide to recipes, restaurants, and retail with a bonus meal planning guide and more! Enter your email in the box below and click Subscribe. You can unsubscribe at any time! Thank you so much for signing up awesome human! Please remember, you can unsubscribe at any time! Disclaimer: All of the content on this website is dedicated to wellness, creativity and more based on the research and knowledge of Carolyn and Tommy Braden. It is not meant to diagnose or assist anyone in need of professional medical treatment. Please contact your healthcare provider if you are in need of mental or physical health help. Get social! Visit Carolyn's social media sites for an even more up close and personal look into her daily creative world.